Young Living Essential Oils, headquartered in Lehi, Utah, has experienced substantially accelerated production due to surging demand in the wellness market, which has blossomed into a multi-billion dollar industry. With an aging population and increased interest in healthy lifestyle options, the wellness marketplace exploded in recent years, and Young Living rose to the top of the industry with their high-quality essential oils. In 2014, the company enjoyed exponential growth, so much so that Young Living announced its commitment to add an additional 445 workers at its Utah operations in the next seven years. “It felt as if we had crammed 10 years of growth into one year,” said Ron Harris, Vice President of Real Estate, Construction & Facilities for Young Living, following the whirlwind year. This rapid expansion placed new demands on a facility that was beginning to challenge production capacity. 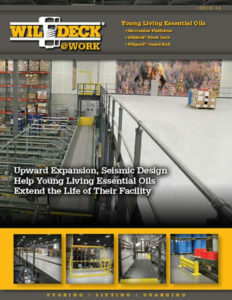 Young Living’s fulfillment and distribution center, located in Spanish Fork, Utah, had been chosen as an ideal location to serve the company for only five years. However, Young Living saw greater potential in the existing facility. When the five year mark approached, they began to seek options for expanding their existing space. The company wanted to provide more pack stations without major remodeling that might impact operations and hinder the company’s ability to deliver customer orders on time. “We found ourselves trying to turn a facility we had occupied for six-and-a-half years into something larger to accommodate growth,” recalled Harris. Young Living contacted Johnson Stephens Consulting who works closely with Kuecker Logistics Group, a respected solutions provider in the wellness industry specializing in integrated material handling systems. 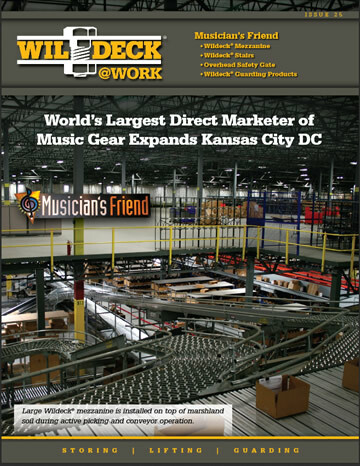 Through prior projects, Kuecker knew that Wildeck produced a quality product and provided excellent customer service. Accordingly, Kuecker asked Wildeck to prepare a competitive quote that addressed Young Living’s unique design constraints. Not only did Young Living need to develop additional usable space in their existing facility, but due to building code regulations in earthquake-prone Utah, the project needed to adhere to design standards aligned with its assigned Seismic Design Category (SDC) designation. In short: Wildeck needed to ensure the finished installation included the most up-to-date design elements to safeguard against collapse in the event of an earthquake. Wildeck recommended a mezzanine platform installation that included moment resistant framing at the top of the column connections. To make the best use of Young Living’s available space, a deck height of 13′ was recommended. 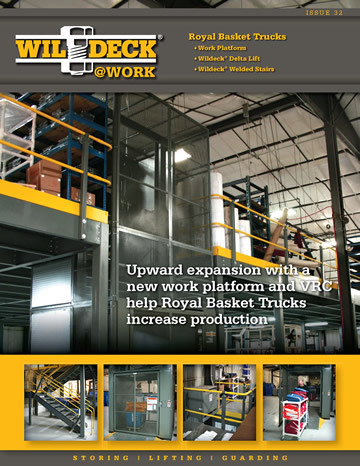 Wildeck also suggested 356 linear feet of 2-rail guard railing and kick plate be installed to keep workers engaged in activities below the mezzanine safe from falling debris. 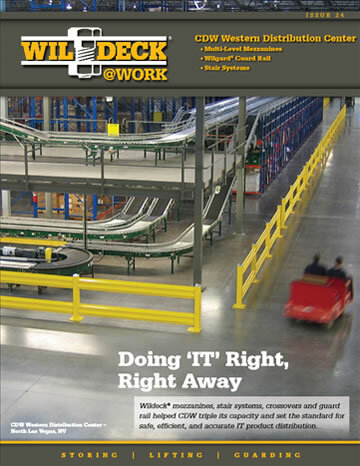 To support Young Living’s commitment to safety, Wildeck also recommended installing Wilgard® high impact guard rail in strategic locations on the plant floor at the same time as the mezzanine platform installation. This approach streamlined the downtime needed for enhancements to the building, and prevented Young Living’s operations from being disrupted by a separate installation in the future. 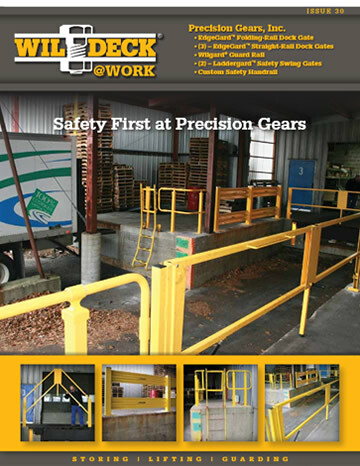 In the long run, Young Living recognized that Wilgard® Guard Rail would protect its investments in both equipment and people, creating a safer work environment and reducing potential workman’s compensation claims or repair costs due to damaged machinery. Installation of the new mezzanine and Wilgard® Guard Rail began in October 2014. “The install was in a busy area with a lot of workstations which made the column spacing critical,” recalled Bingaman. “I’ve been through a lot of remodels but this was pretty seamless,” Harris added. The final mezzanine measured 136′ x 55′ (7,480 sq. ft.). It featured two pivot safety gates that the company will utilize, and they may choose to add vertical reciprocating conveyors (VRC) as they continue to expand. In the meantime, a roller conveyor system will move product from the plant floor to the mezzanine platform, which is designed for 125 pounds per square foot. Two 36” wide external International Building Code (IBC) dual-handrail straight staircases with intermediate landings, closed treads, and open risers allow Young Living employees access to the mezzanine. And of course, the entire structure is designed with seismic safety concerns in mind. By adding more than 7,000 square feet of vertical space to their facility, Young Living will be able to simplify and optimize their operations for domestic and international shipments. “We like the design and it feels very customized to this space,” said Harris. 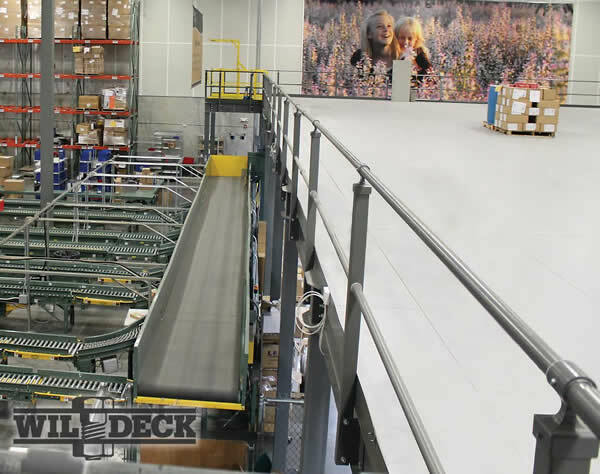 A Wildeck® mezzanine platform proved to be Young Living’s most efficient and economical solution for continued growth within their current facility. Its installation allowed the company to increase profitability by providing additional packing and storage space for inventory to meet rising customer demand. In addition, the added Wilgard® Guard Rail will not only protect Young Living’s employees, but also shield equipment and preserve its longevity for years to come. By utilizing their existing overhead space, Young Living plans to incorporate mezzanines into their new building construction plans. Following the installation, Harris was pleased with the final product. “I would definitely recommend Wildeck. This has been a good experience. The real test for us was getting a partner who could make this project work in our environment with little disruption — and Wildeck did,” Harris said.